Oil sprayers: Canned or home spray bottle? You are here: Home / Accessories / Oil sprayers: Canned or home spray bottle? Oftentimes in hot air frying just a light application of oil is needed to encourage a food item to crisp and brown. You could do this with a brush. But then you have to wash the brush, and the brush might wipe off any crumb coating on the food, and you may be putting on more oil than you needed to. So, it’s a lot of futzing, and maybe not so great after all. Consequently, most people spray some oil on. 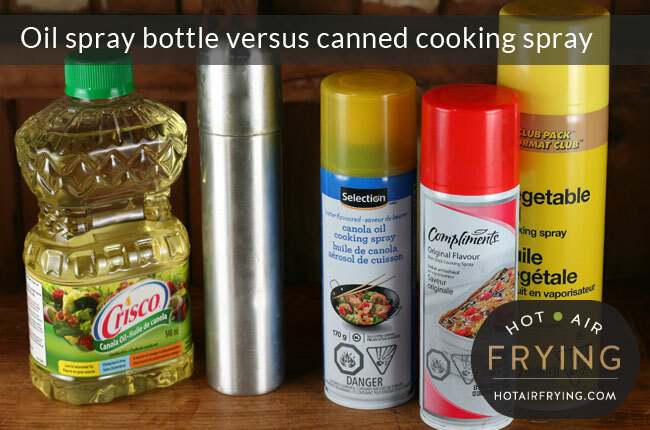 It’s your choice whether to use a “homemade cooking spray” in the form of a refillable oil mister / spray bottle, or, use a commercial cooking spray in a disposable can. There are merits to both arguments. In fact, you may even wish to keep both options to hand. Both will usually do the job. Some people feel that the oil from home sprayers, whatever its other merits, just isn’t as “non-stick” as the cooking spray from cans. Also, at home you are probably not likely to be able to cobble together a cooking spray solution that is as low-calorie as a spray such as Fry Light, which is only 1 calorie per spray.